People nowadays are bombarded with messages, information overload. Here’s how to reduce information overload, get more productive and have a little sanity back into your life. What I have learned about managing time & being productive under pretty extreme circumstances. To put this into context, I run two companies, bootstrapping a tech startup nooQ for over 2 years now, I have a wife, family of two boys, I am a freelance consultant a contract for 40h for one client and 1 part-time client I work for 3–10 days per month. This is my personal system adapted from Tim Ferriss The Four-hour Work Week and David Allen’s Getting Things Done both highly recommended. I can’t recommend RescueTime highly enough. Let’s you see where you spend your time, honestly it will likely be different from where you think. Rules & Filtering is the key. People spend on average 28% of their week on email. There is no magic bullet yet. We are working on it at nooQ but until then email is a necessary evil but you can help yourself avoid inbox overload using these key tips. 2. Get rid of social notification emails who followed you, who commented, suggestions for new friends or new content and put into a dedicated folder (Twitter, Facebook, Linked-In) if you really want also flag it as read. You don’t need to spend time processing these and manually reading or acting on it even worse. 3. Unsubscribe from mailing lists, old software newsletters, digests, notifications from ones you don’t use any-more, email newsletters & anything from vendors trying to sell you something. If you can’t unsubscribe, create a rule to automatically move it out of the inbox into a folder and forget about it until you have free time. I have a Read-Later folder for interesting articles I browse thru when I have 10 minutes waiting for a train or process it in batch mode Sunday morning or as night time reading. 4. Flag emails from important people, customers and partners. Use categories or colours to visually show you in the inbox emails that you can’t miss and give it your full attention. Stops you scanning the unnecessary items and just deal with the important ones. Label items with different colours, so that when visually scanning your in box you can easily see related items. For example, I use blue for waiting for, orange for read-later, red is team emails, green is personal and each customer each gets colors related to their logos. This has to be the best way to stop distractions. 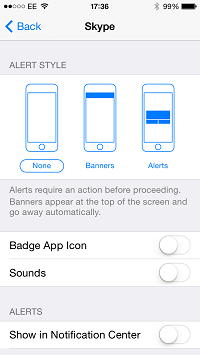 Switch off all notifications, desktop alerts, mobile unread count, mobile alerts from all devices. You will still check email, Facebook, Twitter etc. out of habit, but much less so. I still have the habit of checking it a lot but not having unread bubble count and alerts popping up every 2 minutes is much less distracting. Try it you will be amazed. You won’t feel that urge to keep checking what those 3 unread things are.. again.. two hours later what are those 3 unread ones again? Many applications have several notifications for the same event, one the mobile app, on the web-site and the email reminder. Turn off, ignore and start checking less frequently and when you have time to do so. Do the same for desktop pop-ups. IFTTT – Any tweet I favourite, or I favourite in Pocket will be automatically added to Evernote. Any article I favourite in Feedly will be automatically added to Buffer. The list of ways you can use this is endless. Give it a try. Zapier – Amazing app for getting all your cloud apps into sync. It covers different apps to IFTTT. I use for automatically getting BaseCRM, Linked-in, Google contacts in sync. Any website sign-ups added to Mailchimp, Google contacts and BaseCRM automatically. Unsubscribes are also removed from Mailchimp & CRM. Pocket – My Twitter client Tweetbot automatically saves interesting links from to read later in pocket. The Google Chrome plug in on my browser to save for reading later makes things simple. Buffer – Schedules tweets, facebook posts, linked-in and google plus posts spreading them out over the week when people are most likely to see them. Integrates great with one click from Chrome plug-in. Also integrates beautifully with Pocket & Feedly. Feedly – All blogs in one place. I never watch tv or read newspapers, blogs are infinitely more educational. I use this as a great source to share via social media accounts via Buffer. BaseCRM –The best function and one main reason apart from the design of this app is clipping contacts from Linked-In to BaseCRM which is awesome for adding prospects and contact info into BaseCRM. Syncs with Google Mail, Calendar & Drive. 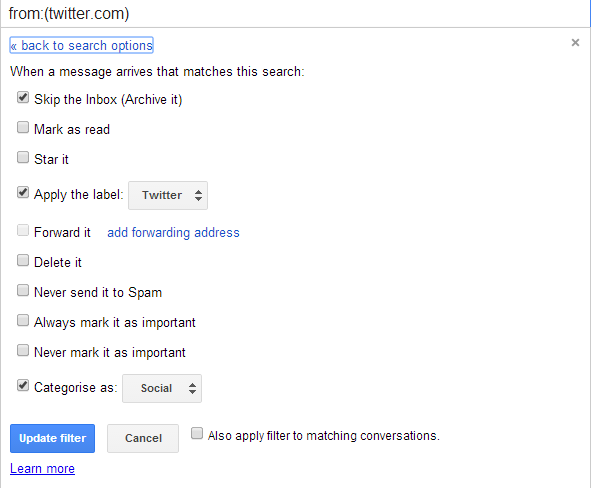 Google Mail — Filters and Rules work best on Google Mail. I’ve had several instances on Outlook where rules are temperamental & I have been lost the lot, which is annoying when you have over 200. Apple Mail rules aren’t 100% reliable either. Google Calendar works far better than Apple and Outlook calendar. It is far easier and more reliable to integrate and share. Share the public link to your calendar, delegate it to others, so they can book appointments in your diary. No more going back and forward on can you make this date or that date. Share the URL to your public calendar and delegate to let others choose. You will obviously have time booked to complete what you need to complete. There’s no getting away from it, we still need to process paper. You still need to avoid getting information overload in offline world too! You need a system to organise, file and retrieve paper as simply as possible. Get foolscap folders, lots of them and a labelling machine. Once a week review what needs filing, review the to-do list and plan for next week/month/three months. Once per year review 1–2 year goals, 3–5 ear goals and life goals. Schedule tasks in the diary to accomplish what needs done. I always like to start the week planning key deliverables for that week. For me, typically 2–3 is enough. For example high level tasks like doing a presentation for a conference event, get 2 new customers on-board, new 3 minute pitch. Then schedule time in to complete them. Typically I need to juggle and spin a lot of projects at once, I like to balance my week so typically Monday is Customer Development, Tuesday Product Mgt, Wed Finance, Thursday Product Mgt, Friday Networking, Saturday Family day and Sunday – Reading & Product Dev. Timeslot activities in the diary to give yourself a deadline and not be distracted. This make sure I don’t end up spending too much time in one area, keeps each area moving along. Breaking projects down into smaller tasks helps make sure I spend some time on each area, on time, by priority but always with the longer term in mind. 3. Do things in batch mode. Do similar things together. Send and reply to emails all at once in one time slot. Group together several calls and do them one after the other. When you are in phone mode, email mode it makes it easier as you are in the frame of mind and not constantly switching. For email 0800–0900, 1200–1300, 1600–1700. Whatever slots work for you but use three or four times to process all emails. Do the same for phone calls, incoming calls are a distraction, switch off phone or send straight to voicemail. Return calls when it suits you. Typically I make them when on the go, walking, driving, preparing food, making tea/coffee etc. 5. Get creative in dead-time. Time that you travelling and not in front of a device when driving, waiting for train or plane use them to educate yourself via audiobooks or podcasts. Process things from Pocket, Read-Later folders. Only consider actions that can be performed in the current context, location, amount of time available and your energy level. There is no point getting to-do list notification to scan a document, when you are at the gym. Don’t plan to do your financial accounts or tax return on a Friday night when it will be the last thing you have the energy for. Have I missed anything? Hope that helps avoid information overload and make your life a little easier. If you have any other tips please tweet me.